NRA President David Keene on Fred Dicker’s Talk-1300 radio show defended the use of Hitler’s image in the context of the New York gun control law after several signs at yesterday’s rally compared Gov. Andrew Cuomo to the Nazi dictator. In the interview, Keene said that protestors and gun-rights advocates understood that dictators stripped citizens of their right to own a firearm. “Folks that are cognizant of the history — not just in Germany but elsewhere — look back to the history and say we can’t let that sort of thing happen here,” Keene said in the interview. It’s not the first time that Hitler has been invoked when it comes to the gun control law. Republican Assemblyman Steve McLaughlin apologized last month after he said Hitler, Mussolini and Stalin “would be proud” of how the measure was passed with a message of necessity. Keene attended the rally yesterday against the law, one of the largest in recent memory that organizers say drew 10,000 people to the Capitol in Albany. Print article This entry was posted by Nick Reisman on March 1, 2013 at 12:37 pm, and is filed under Andrew Cuomo. Follow any responses to this post through RSS 2.0. Both comments and pings are currently closed. Extreme right-wing anti-Semitic idiots who have no respect for anyone other than their WASP selves. May they trip over their guns and shoot themselves. The above was just for you, cee pee-pee retiree. The Nazi’s armed millions of German citizens, in fact most military age German males ended up being very well armed under Hitler. Also, the Nazi party had millions of supporters in paramilitary gangs prior to taking power, and that they made it easier for those they considered real Germans to buy guns during their tenure before the war. Anyone talking about the militaristic, chauvinistic Nazi’s as an example of a regime opposed to “their” people being armed is an abject imbecile. Now, they certainly did not want to see those they considered the race enemies of the Germans to be armed but who arms their ‘racial enemies’? I don’t see Keene urging us to allow ‘illegals’ to buy guns. Also, even if 10,000 people showed up (which is not remotely true), NYS has 19 million people and every poll since the bill passed shows a majority of NYkers approve. Sorry old white guys in cammo. To those who dont get it…..people like quomo and bloomberg feel they are the elite and deserve heavily armed security of eight or more( comparison hitler and elite germans)….. the other 99% of citizens should not own firearms to defend themselves( the jewish population)…. But it was fun being back in the third grade for a minute there. Folks that are cognizant of history know that Hitler LOOSENED gun laws progressively over several years, not took away German’s guns. Either the NRA-ers don’t know their history or think the rest of us don’t. In fact, their coercive tactics used to loosen American gun laws are FAR more correlative to Hitler than gun control advocates are. Gepap, tell your tale to the Jews, homosexuals and disabled (the unfit) in Germany circa 1938. I think those groups have the reading comprehension to get it, unlike yourself. I would refer you to the bit about not wanting the ‘racial enemies’ of the Germans to be armed. Perhaps you are utterly unaware that the Nazi party did not see those groups they sought to exterminate as parts of the German polity at all (in the case of Jews) or parts of the German polity that had to be exterminated for the sake of the Volk’s purity. That is why I bought up “illegals” I don’t see Keene advocating for allowing illegal immigrants to arm themselves to protect their freedom from those evil Federal DHS agents seeking to remove them from their current homes. Gepap, were you even at the rally? If you were, you would have see the Well become body to body with overflow up the stairs and over and out the hallways. If you were outside you would have seen (as per the NYS Police people I spoke with) the largest gathering in Albany History. I was there and have attended many events in Albany and assure you, 10,000 is a low ball estimate of the people there. I saw the rally, and I saw the crowds in the concourse, and I can also count by eye. There were certainly NOT 10,000 people there by any stretch of the imagination. You can make any claim you want, but when the speakers were speaking the rally did not even fill that park between the Capitol and the Alfred E. Smith building. Your claim that his is the largest gathering in “Albany History” is patently absurd as any Tulip Fest or St. Patrick’s Day parade day sees more people in one place in Albany than this rally had. Hyperbole doesn’t make you believable. “Any man who doesn’t have a gun is useless to me and my movement.” Adolf Hitler’s Nazi movement was all about getting rid of the then existing Democratic form of government in Germany. Like the NRA, Hitler often projected motives onto his rivals that didn’t exist in the first place. In the NRA’s case it’s the idea that Government on all levels wants to take away your guns by confiscation after repealing the 2nd Amendment, Just like Hitler the NRA is selling lies, posing as truth and seeking your loyalty to create a violent opposition to the laws of the land. It’s displayed by encouraging citizens to not register their guns and letting people avoid background checks. Ha HA HA!!! I see you fell for the bait, airhead. The joke’s on you, pal. Ever heard of reductio ad absurdum? The one thing I am serious about is how extraordinarily ignorant and nauseatingly offensive it is for people to hysterically compare someone with whom they have a political disagreement regarding a regulatory matter to a psychotic butcher, easily the most evil man of the 20th Century (in a VERY crowded field, I might add) who sent 6 million Jews and millions of others to their deaths and orchestrated gruesome, sadistic tortures designed to maximize pain and suffering on a systematic basis. This is shameful and utterly beyond the pale. Their cause is doomed by the very savagery of their tactics. And if you care to read on, you can see how I agreed 100% with Conservative Republican VJ Machiavelli regarding the use of Mussolini and negative Italian stereotypes against a Governor of Italian heritage by this gang of thugs. and call her on saying the NY Safe Act is an infringement on 2nd Amendment rights. She has made every Gun Nut meeting in NNY to speak against this law. She doesn’t support Gun Control legislation and it’s time to make it clear you don’t care for her misrepresnting your views and distorting what your legislation the -NY Safe Act- stands for in efforts to curb gun violence in NYS. Hitler loosened up gun laws for germans but prohibited the jew from owning weapons of any kind not even a walking stick….funny how people talk of history and leave that part out…. You stated elsewhere that you had “mellowed” over the past year. Sorry to say, your venomous, all-over-the-map ranting makes it obvious that it’s a little more serious than that. So sad, too. The only “bait” I fell for was seeing some familiar names here that I remembered as offering sane, sensible and cogent arguments. Thanks, Mr. Ipso Facto, for reducing that number by one. 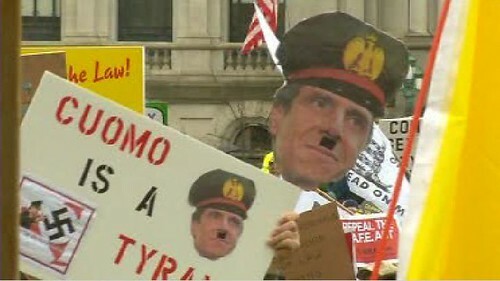 I don’t much care for that small FRACTION of the thousands of demonstrators, who compared Cuomo to Hitler, either. And if you choose to lump me into that group, please show me when and how I’ve endorsed them. So take your fight to THEM, and stop inferring that the entire group shared that sentiment. If that was the overall theme of the demonstration, or if press reports showed a virtual sea of those placards, we’d have a huge problem on our hands. For God’s sake, you’d find similar nitwits in a crowd that opposes Stewart’s decision to change one of their ice cream flavors. By all accounts, it was a peaceful and orderly demonstration: no arrests; no disturbances; no mass-gun waving; no torches and pitchforks; no shots fired into the air; no outcries for Cuomo’s head on a stick; no defecation on the Capitol steps; no mounted APD wading into the crowd, spraying mace; no mobs through downtown streets, carrying tents and disrupting traffic. Yes, the lawn was trampled; but there’s an effort underway by the demonstrators to repair it. “the very savagery of their tactics” ? “utterly beyond the pale” ? I’ll take “distasteful” for $100, Alex. So get a grip IM, et. al. [that’s short for “et alii” — and others — aimed at your assorted noms de plume], and check that med schedule. Oh, and I’m sure by now you’ve heard Andrew on tape, saying that “confiscation could be considered an option.” Why…oh why…would he say that? You ordering the governor to attack another politician with an opposing view is so typical of your posing, cult like liberal views.You tend to forget that she represents a constituency and acts as their voice in Albany. But of course in your small mind there is only a small fringe in NY that disagrees with your king. You are a disgrace to the institution of “By the people ,For the people”, but of course that only works for you when nobody disagrees with your people! Hey utter imbecilic jackass, your pointless post does not really say anything to show that you know history: all it shows is that your grasp of invective is limited, which from a halfwit like you is no surprise. You lost, get over it. Now go away, cause trying to have a battle of wits with a dimwit is pretty sad. should go to Cuba and get a real good drilling, from a guy who knows one when he sees one. Fidel may have been a terrible leader but he has kept the beaches clean, so be prepared to be used as shark bait you Hitler loving degenerate. is fair game and her record is laughable to anyone who studies it. And we’ll all be studying it real close from here on out rest assured, who knows she might actually follow through on something important to the 46th District, but I won’t hold my breath waiting to see that happen. You talk like a facist Nazi thug Mr. Otto, express yourself like a human being please, this isn’t some Nazi propaganda rag sheet and Mrs. Grazzini is right. You divert from the point over and over again. Attacking a politician over their record is one thing, commanding the governor to attack them is absurd. You truly have lost it. Pattie Ritchie ran on supporting the Governor’s program and that is the point. Sen. Ritchie now has rejected the Governor’s program. At this point she isn’t expecting his support if she has a brain in her skull, so no one had to deliver the news, that she’s on the outside looking in just like Skelos. Mike, you have a real future in politics.You have mastered the science of talking in circles but avoiding the real point. If you can read when I first responded to you, you were ordering the governor to attack Ritchie for having different ideology than yourself. She supported his middle moderate politics until he went off the reservation.I am sure she does not want his support or yours at this point as that would really make her look like an idiot. Regardless, I am finished with this one sided argument. Anyone that needs to see what you are about can follow the posts and see for themselves. shows you know he had an agenda of deception from the beginning. You can not blame her for distancing herself from him when even the people that put him in office questioned his loyalties. Maybe you should concentrate on what color socks Mayor Graham is wearing today or something more basic before you jump farther into State politics. when you can put together a race for Governor together as a Republican that gets your candidate 35%, how dare you say that anything approaching a popular mandate against the Governor’s program exists; are you delusional? Get some facts on how campaigns are won together and then read about it, because you sure don’t know about it. Apparently this is the real problem with our country. We each feel we are right and have no room to compromise with each others ideology. I guess it will all come to a head at some point and probably end badly. The great moderate Ritchie won her district with 70% of the vote! That is more than Cuomo beat Crazy Carl by! Now Cuomo has Mayor Miner and Comptroller Dinapoli calling him out for his attempt at a gimmicky back door pension raid. And just like with Ritchie you want them thrown in prison camps for disagreeing with Mein Fuhrer. Sorry, but Duombo made a big miscalculation in choosing not not to hide his left wing extremism on this issue. He will never see a national office again. Not that HUD or any other office could survive his “leadership” again.